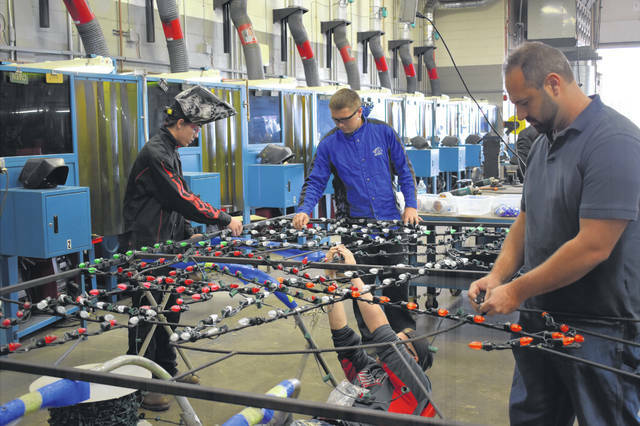 Michael Doellinger, left, and John Lantz, center in blue, wire a light display with the help of Dante Bando, right, and Noah Warsham, who works below the display at the Delaware Area Career Center’s North Campus Friday. Students created a display for Butch Bando’s Fantasy of Lights last year, but this year’s display is several times bigger, Bando said Friday. Abby Vaughan, a senior in the construction program, wires a ticket booth Friday afternoon. DACC Construction Instructor Gene Scott said he’s glad his seniors are able to practice wiring the booths, because it will make it easier for them when they move to wiring a house. Welding students at the Delaware Area Career Center are helping out with Butch Bando’s Fantasy of Lights again this year and are joined by students from the career center’s construction program. Dante Bando, the operator of Butch Bando’s Fantasy of Lights, was at the career center’s North Campus Friday helping students wire the light displays. Bando said he was glad to partner with the career center again. The two seniors leading the welding project, Michael Doellinger and John Lantz, said the project has been a great learning opportunity for them and their classmates. Lantz said it’s been interesting to see which students need instruction or motivation and which ones just move from one task to another. The pair said welding students have been working on the project several hours every day, five days a week, for the last five weeks. In the construction lab, students are creating 10 ticket booths, so the employees at the light show aren’t standing out in the cold. DACC Construction Instructor Gene Scott said his juniors built the booths to get practice with power tools. He added his seniors will be wiring them, which is technically ahead of their classwork about wiring a house. Scott said having the seniors wire the booths before their full instruction on wiring is actually a good thing, because it gives them practice and allows them to make mistakes on a small scale, instead of while building a full-size house. Abby Vaughan, a senior from Westerville Central, said she was enjoying working on the booths and learning about basic wiring. 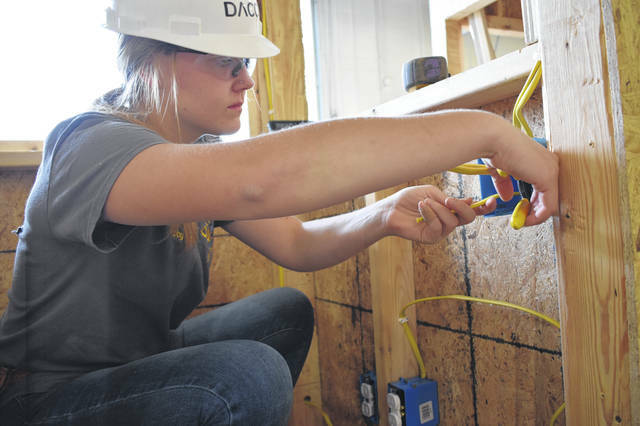 Collin Brant, a Buckeye Valley construction senior, said students are also getting accustomed to the electrical and wiring codes in Delaware County, which he said is better than just learning the basics. “It’s been pretty fun so far,” Brant added. Bando said he hopes the students get experience and enjoyment out of the project, but he also hopes they learn about charity and philanthropy. https://www.delgazette.com/wp-content/uploads/sites/40/2018/10/web1_DSC_0586.jpgMichael Doellinger, left, and John Lantz, center in blue, wire a light display with the help of Dante Bando, right, and Noah Warsham, who works below the display at the Delaware Area Career Center’s North Campus Friday. Students created a display for Butch Bando’s Fantasy of Lights last year, but this year’s display is several times bigger, Bando said Friday. https://www.delgazette.com/wp-content/uploads/sites/40/2018/10/web1_DSC_0592.jpgAbby Vaughan, a senior in the construction program, wires a ticket booth Friday afternoon. DACC Construction Instructor Gene Scott said he’s glad his seniors are able to practice wiring the booths, because it will make it easier for them when they move to wiring a house.